Vaadin is a server side scripting language, written in Java, which will generate most of the client side code needed for a web application. It uses Google Web Toolkit to generate the client side objects and can be extended by creating by extending the Google Web Toolkit. Vaadin plug-in for eclipse provides a quick way to build vaadin project with Apache Ivy dependency manager. Vaadin's documentation explains how to create vaadin project with the help of Eclipse plugin. To install the plug-in just go to eclipse marketplace and search vaadin. Current version of the plug-in is 3.0.0 . So, after setting up the plug-in, just create new Vaadin project with minimal configuration. You can also specify version of vaadin while creating the project. It will take time to download all the jars required for vaadin,once Ivy resolve all the dependencies. You can directly run the project on the server and you will see one Button with Click Me in the browser screen. Kindly note that Vaadin7 is compatible with Java 6 and newer. With Maven you can create Vaadin project with vaadin-archetype-application archetype. You can also add that archetype in IDE to create maven project with IDE. Once you execute above command you will have following project structure. The created default maven project can be imported in IDE directly. 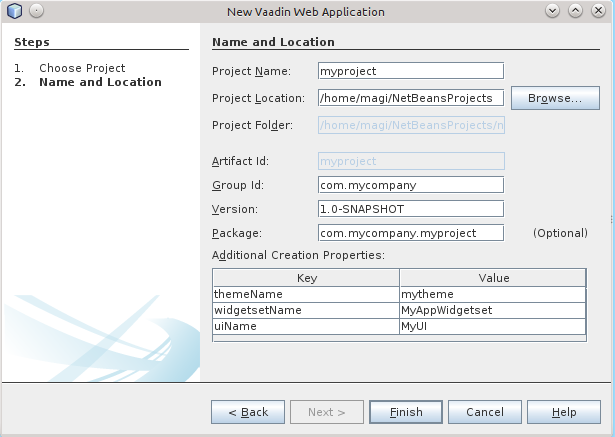 To run the maven application we must compile the default widget sets of vaadin. Note that we can directly use following maven command to package vaadin application and it will compile the widgetsets by default. You can use maven jetty plugin to deploy the vaadin application on Jetty. This will deploy default application and start running it on default port 8080 . You can access the deployed application at http://localhost:8080. It is ready to run without any changes. By default Vaadin archetype adds default theme, widgetset xml and MyUI class which is an entry point for vaadin application. In browser we will see following form. First program - "Hello World"
After lauching was successful, please navigate to localhost:8080/yourApplicationName or http://localhost:8080/ to see your app is up and running. 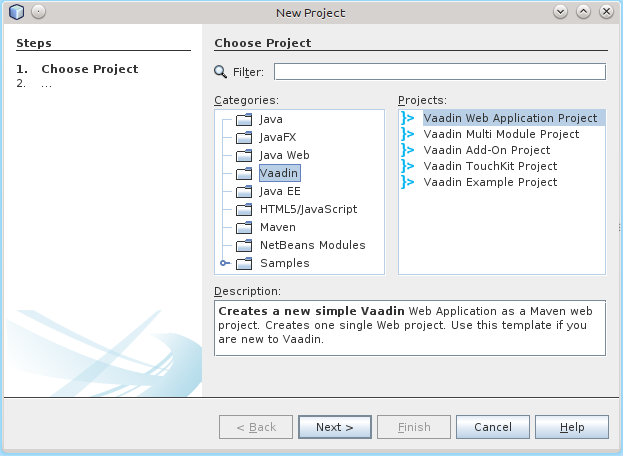 In the following, we walk you through the creation of a Vaadin project in NetBeans and show how to run it. Installation of NetBeans and the Vaadin plugin is covered in Installing the NetBeans IDE and Plugin. Without the plugin, you can most easily create a Vaadin project as a Maven project using a Vaadin archetype. You can also create a Vaadin project as a regular web application project, but it requires many manual steps to install all the Vaadin libraries, create the UI class, configure the servlet, create theme, and so on. Select File ▸ New Project…​ from the main menu or press Ctrl+Shift+N. In the New Project window that opens, select the Vaadin category and one of the Vaadin archetypes from the right. The archetypes are described in more detail in Overview of Maven Archetypes. In the Name and Location step, enter the project parameters. A project name. 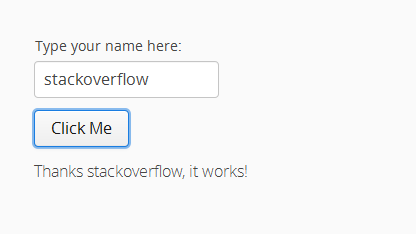 The name must be a valid identifier that may only contains alphanumerics, minus, and underscore. It is appended to the group ID to obtain the Java package name for the sources. Path to the folder where the project is to be created. A Maven group ID for your project. It is normally your organization domain name in reverse order, such as com.example. The group ID is also used as a prefix for the Java source package, so it should be Java-compatible package name. Initial version of your application. The number must obey the Maven version numbering format. The Java package name to put sources in. The properties control various names. They are specific to the archetype you chose. 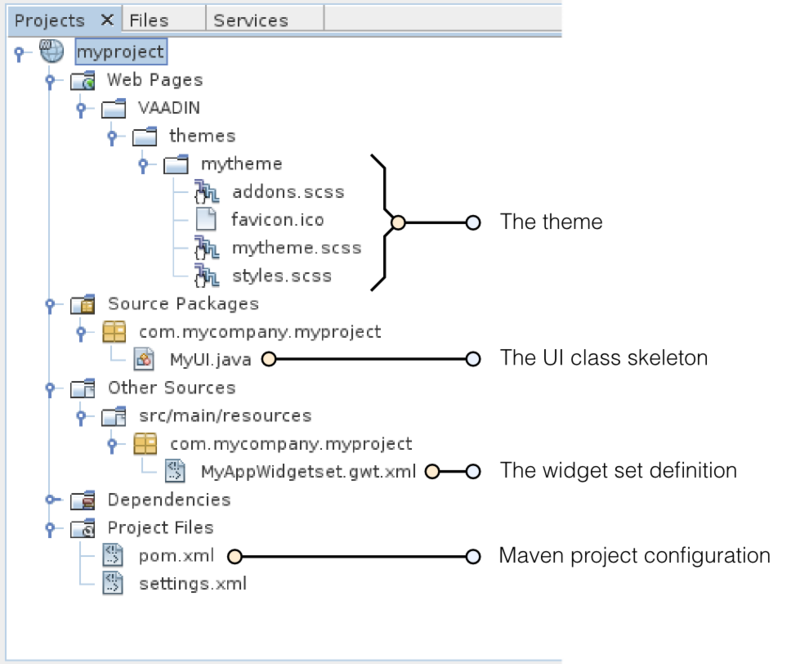 Creating the project can take a while as Maven loads all the needed dependencies. The theme of the UI. See Themes for information about themes. The UI class, which is the main entry-point of your application. See Server-Side Applications for information about the basic structure of Vaadin applications. Once created, you can run it in a server as follows. In Projects tab, select the project and click in the Run Project button in the tool bar (or press F6). In the Select deployment server window, select a server from the Server list. 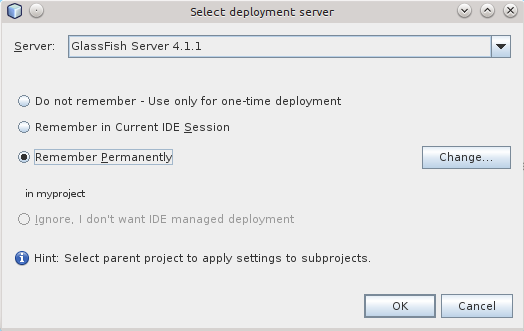 It should show either GlassFish or Apache Tomcat or both, depending on what you chose in NetBeans installation. Also, select Remember Permanently if you want to use the same server also in future while developing applications. The widget set will be compiled at this point, which may take a while. If all goes well, NetBeans starts the server in port 8080 and, depending on your system configuration, launches the default browser to display the web application. If not, you can open it manually, for example, at http://localhost:8080/myproject. The project name is used by default as the context path of the application. Now when you edit the UI class in the source editor and save it, NetBeans will automatically redeploy the application. After it has finished after a few seconds, you can reload the application in the browser.